﻿ Welcome to kendonagasaki.org, a Portal for Enlightenment and Empowerment! This is kendonagasaki.org, the Official Website of the Legendary Masked Wrestler and Mystic. Click the picture above to SEE THE PROMO VIDEO and BUY this amazing book! 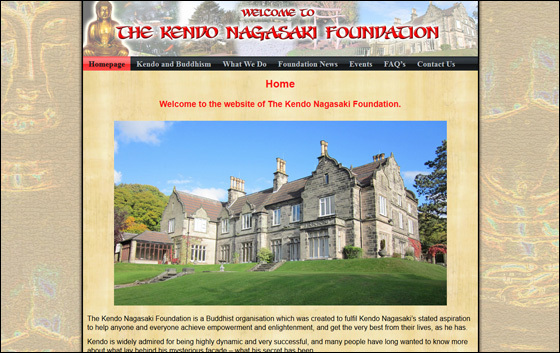 The Kendo Nagasaki Foundation: Kendo's Dynamic Charity! Kendo Nagasaki is an excellent example of strength, success, and ability, all expressed to their maximum potential. For those who would seek the same clarity, poise, and empowerment, he cites Buddhism as the foundation of achieving all this. At the "Events" he holds at his country Retreat, Kendo introduces people to techniques for achieving deep peace and freedom from stress - which is empowering in itself - and this leads to an awakening of a person's innate creativity and vision, which elevates self-confidence and self-expression to a whole new level. Having enabled a great many people's personal empowerment for over 40 years, this work is now Kendo's primary focus, and he welcomes the opportunity to share Buddhism's gentle yet highly effective empowering techniques with as many people as possible. Kendo's Amazing Movie is Available Now! This remarkable film shows behind-the-scenes footage of Kendo at his Retreat, preparing for his last ever wrestling match, followed by the journey to the match when he reviews his previous encounter with his opponents, the match itself (a truly explosive event! ), and more behind-the-scenes footage back at Kendo's Retreat. It's a fascinating insight into the ongoing mysteries behind this iconic superstar of British Professional Wrestling. Get your copy NOW!!! 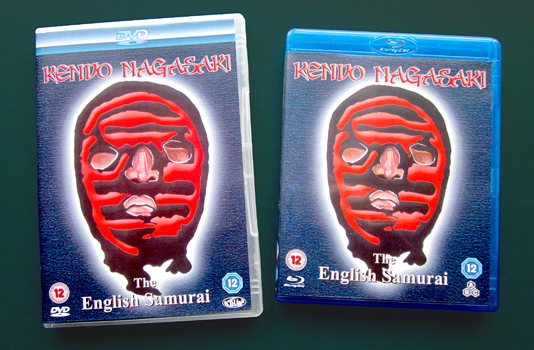 Kendo Nagasaki is an icon of British culture - as an athlete, he is an unbeaten international star of British professional wrestling, and behind his legendary mask he is an accomplished healer and mystic. Always mysterious, Kendo has been in the public eye for a remarkable five decades, and he continues to be revered, respected, and admired, both as an outstanding athlete and an inspiring source of empowerment, wisdom, and healing. Here you can find out all about Kendo's spectacular wrestling career and his spiritual wisdom, by using the "Time-Lines" on the pages within - there's one for the wrestling pages, and one for the mystical pages. Just drag the scroll-bar below the pictures across to choose an event, and then click on any of the images to be taken straight to the relevant chapter. As can be seen in the final chapter of the wrestling Time-Line, it has long been Kendo's stated ambition to bring the kind of power and success that he has demonstrated in the wrestling ring and as a mystic and healer to anyone who seeks enlightenment and empowerment, and he has been making more and more of his spiritual teachings and techniques available. Consequently, if you would like to know how Kendo's spiritual wisdom can help you to find your place in the universe, to understand and face up to life's challenges, to begin to see the "big picture" of your own many past lives, and much more, you will find a great many answers here. If you wish, you can go straight to the Mysticism and Empowerment section of the website to begin your own journey of enlightenment and empowerment. Also on the website, you will find Kendo's Blog, where news about all things Kendo is announced, as well as the Nagasaki Web Store, where you can buy everything from a Kendo Nagasaki T-shirt to an Empowerment Meditation to Kendo's new movie, "The English Samurai". and - above all - empowering!